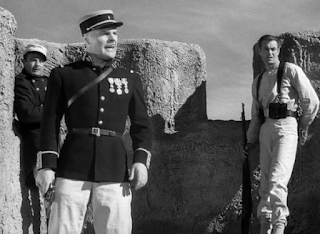 An epic military adventure about brotherhood and sacrifice, Beau Geste is an absorbing and richly rewarding drama. 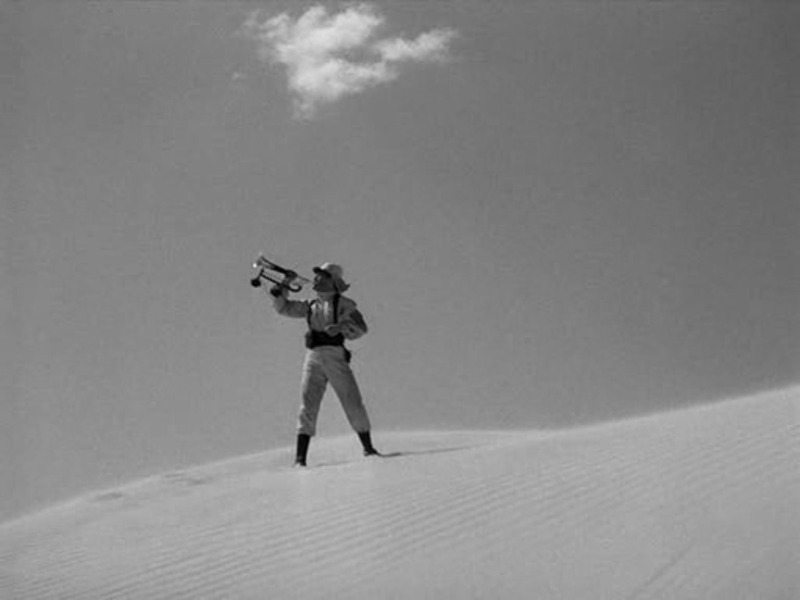 It's the middle of the Sahara desert, and a French Foreign Legion relief column, responding to reports of Arabian tribal attacks, arrives at Fort Zinderneuf and finds no signs of life. All the men inside the fort are dead but positioned at their parapet firing stations with rifles pointed at a departed enemy. Only two men lie dead in more natural positions, one of them killed by a sword and holding a note confessing to the theft of "Blue Water", a precious gem. Fifteen years earlier, the Geste brothers Beau (Gary Cooper), Digby (Robert Preston) and John (Ray Milland) are adopted orphans being raised by the kindly Lady Patricia Brandon (Heather Thatcher). The brothers are close friends and dream of joining the French Foreign Legion. Patricia is running into money problems, and her one remaining precious asset is Blue Water, a massive sapphire worth a fortune but also legendary for bringing bad luck to its owner. The boys grow up into upstanding young men, and John falls in love with his childhood sweetheart Isobel (Susan Hayward). One evening Lady Patricia and her adopted sons are admiring Blue Water when the lights go out and the jewel disappears. No one confesses to the theft. 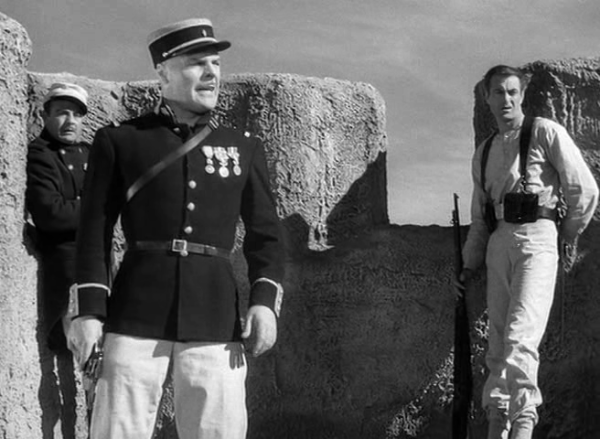 Soon after, the three men do join the Foreign Legion and undergo training at the hands of the brutal Sergeant Markoff (Brian Donlevy). Digby is separated from his brothers before circumstances lead to a reunion at Fort Zinderneuf. A remake of the 1926 silent film and making use of the same sets, the 1939 version of Beau Geste is a lavish adaptation of the classic P.C. Wren novel. Director William A. Wellman and his excellent cast weave the intricate story with confidence, delivering in under two hours a deeply satisfying adventure touching on themes of military honour, family bonds, companionship, and sacrifice. The narrative arc is supremely elegant. The opening scene at an isolated fort filled with dead soldiers is unforgettable, setting a sweeping mood of anticipatory dread. It is followed by a flashback to events 15 years prior with the Geste brothers as young boys, Wellman and screenwriter Robert Carson cleverly unveiling the brothers' personalities and future legacies. Both scenes boast details that will echo back in amplified tones close to 100 minutes later, when the events at the fort are finally revealed. A large part of the film's appeal lies in the complexity of the characters. None of the Gestes are presented as impeccable heroes, lending weight to the mystery of the missing Blue Water gem. And the ambitious and brutal General Markoff, the closest thing to the villain of the piece, gets plenty of time to demonstrate his qualities when the going gets tough. Brian Donlevy's chilling turn as Markoff, bordering on psychotic but finding an arena where psychosis may be a good thing, was deservedly nominated for an Academy Award. The rest of the cast members share the screen time, with Gary Cooper, Ray Milland and Robert Preston getting their individual moments without dominating. In one of her earliest roles, Susan Hayward gets a relatively few scenes. The rest of the supporting cast is filled with sturdy character actors, including J. Carrol Naish, Albert Dekker, and Broderick Crawford. Beau Geste is packed with plot, and all the pieces come together in the rousing final act. Once the action moves into the fort for the final third of the film the mystery of the missing jewel intermingles with a brewing mutiny and an external threat to the troops. At the middle of it all are brothers looking out for each other. Wellman never loses sight of the heart of his story, and proceeds to deliver one of the screen's most poignant farewells. Whether in the comfortable surroundings of home or in an unforgiving desert surrounded by death, gallant gestures matter.